Isaac Jogues was born in Orleans, France, January 10, 1607. Jogues entered the Society of Jesus in 1624 and was ordained in 1936. His first assignment was in Canada to work with the Native Americans. While aiding the Ojibwa tribe he was caught in the battle with the Iroquois tribe and was taken captive. Jogues was tortured and beaten and escaped after 13 months with the help of the Dutch. The Mohawk Indians accused Jogues of witchcraft and murdered him in 1646. Pope Pius XI canonized Isaac Jogues in 1930. 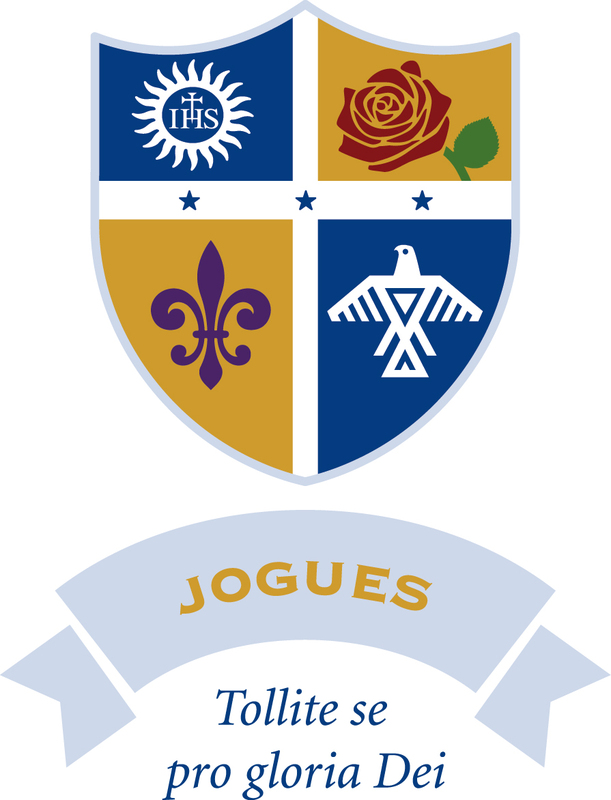 The Jogues crest emphasizes blue and gold, the colors of our school and our house respectively. The accent colors red, green, and purple tie the crest to the other three houses. The shield at the center of our crest is divided into four sections by a cross, marked by three stars representing the Holy Trinity. The two sections on the left side of the cross touch on St. Isaac Jogues' foundations. The upper section depicts the Jesuit seal indicating his position in the Society of Jesus. The lower section showcases the Fleur-de-lis, a symbol of his French heritage. On the right side of the cross, the images depict St. Isaac Jogues’ actions in the world. The upper section houses the red rose of martyrdom. The lower section depicts an eagle standing in for Ondessonk or “bird of prey”, a name given to him by the Huron—a people to whom he originally ministered.